Due to limited seating, reservations are necessary for public programs and may be made by telephoning (757-547-0153). Call the Chesapeake Public School switchboard between 8:00 a.m. and 4:00 p.m. weekdays. To speak with the director, contact Dr. Hitt’s office (757) 547-0153 (ext. 208) Monday through Friday, from 2:00 p.m. – 4:00 p.m. 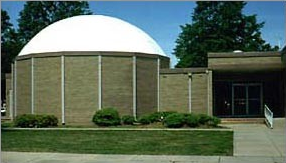 The Chesapeake Planetarium is located in the Chesapeake Municipal Center at 312 Cedar Road, Chesapeake VA, 23322. It is easily reached by taking Interstate 64 and exiting at the Battlefield Boulevard South Exit (Rt. 168). Follow Route 168 to Great Bridge and turn right onto Cedar Road (Rt. 165).The Municipal Center is one-fourth mile on the right.